From peppermint patties to toothpaste, peppermint is widely known as a tasty flavoring. It is also beneficial to your physical health — its use as medicine dates back to ancient Rome, Greece and Egypt. What are its benefits for women’s health? Peppermint is actually a ‘hybrid’ mint, meaning that it is a cross between two other species, specifically watermint and spearmint. It hails from Europe, and is now grown all over the world. It is not hard to grow — it will actually take over your whole garden! It is wiser to grow it in containers. The leaves and the small bluish-purple flowers at the top are the usable portion of the plant. They should be collected and carefully dried as soon as the flowers begin to open. If you’re not interested in growing it yourself, products containing peppermint in its usable and beneficial form are abundant. 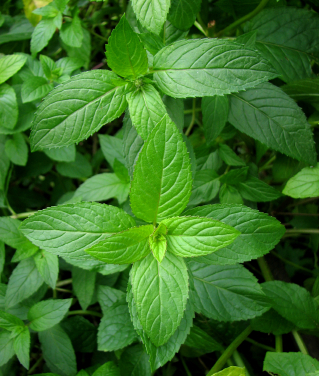 Menthol comes from peppermint, and has many therapeutic uses. Peppermint oil and peppermint tea are also therapeutic to women’s health. Menthol is obtained from the oil of peppermint. It actually has local anesthetic and counterirritant (creating irritation in one area in order to lessen sensation or irritation in another) qualities. It is commonly used to relieve sore throat. It actually triggers the cold-sensitive receptors in the skin — which results in the cooling sensation it produces if ingested, applied topically on the skin, or inhaled. Its soothing qualities make it a prime ingredient in topical pain relievers, soaps and shampoos. It also has a very pleasant, fresh smell — naturally. Peppermint oil and peppermint tea are beneficial to the digestive system, and are clinically proven to help reduce the symptoms of irritable bowel syndrome. One specific action peppermint has is that it relaxes the sphincter muscle between the esophagus and the stomach, which promotes belching and provides relief. Other benefits come from the high amounts of vitamins A and C it has, and manganese. Manganese is a trace element needed by the body for enzymatic activity. It acts as a co-factor — meaning that it is needed to help certain enzymatic reactions occur. Peppermint also contains trace amounts of fiber, calcium, iron, folate, potassium, tryptophan, magnesium, omega-3 fatty acids, copper, and riboflavin. What does all of this have to do with Mother’s Day? If you’re in need of gift or activity ideas for your Mom’s special day, why not brew up a large batch of peppermint iced tea, have a picnic, give her some nice peppermint oil supplements for digestive health, a fresh smelling peppermint soap, along with a pretty peppermint plant for her very own? You can’t go wrong — peppermint is one of, if not the most, pleasant herbs there is, with proven soothing benefits for women’s health.